I have a workshop this evening! I do not do them often due to my family's schedule. This is a the Hostess Gift bag I made- using the Friendship Blooms and Bali Breeze paper. 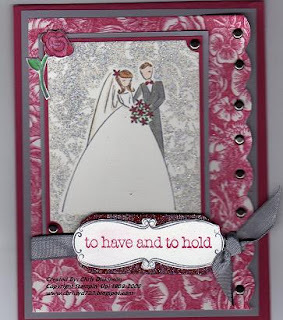 Cardstock and Ink: Regal Rose, Old Olive, Pale Plum, Whisper White Craft Ink and Shimmery White cs. Accessories: White EP, Heat Tool, Giga Scallop Punch, Olive grosgrain, Paper piercing Tool, Dimensionals, White Gel Pen. Thanks for looking! Have a fabulous evening! CBC6 -Chrissy's Belli Challenge - PUNCHES! This Weeks Belli Challenge is PUNCHES!!!! There are SO many different things we can do with punches besides our basic shapes! So go GET PUNCHY and share your designs with us! Make a completed project and share the link here in the comments linkingto my Blog and CBC6. Be sure to post a link to your card mentioning my Blog and the Challenge for a chance to win a pack of 8 1/2 x 11 cardstock from Stampin' Up! 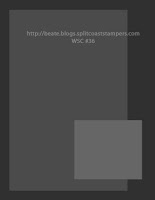 When you post to Splitcoaststampers or to your Blog, be sure and put CBC6 as the KEYWORD and mention of the challenge! Then make a comment under this with a link to your card and a number so we can do a Random drawing for the winner.Deadline to make a comment with the upload and do the Challenge will be on Monday evening. A random drawing will be held on Tuesday and the winner will be announced on Wednesdays! 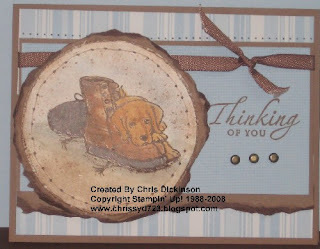 The winner of last week's Challenge is: Nancy Grant, check out her AWESOME blog and her creation using CHIPBOARD! Accessories: Anchorage Rub Ons, Fine Cosmo Glitter, paper Piercing Tools, Black Marker, sponge, Paper Snips, Tab Punch, 2 way glue pen, dimensionals, large and small punch, pencil for cheek colors! First off let me say, I got this idea from Debby M's blog. 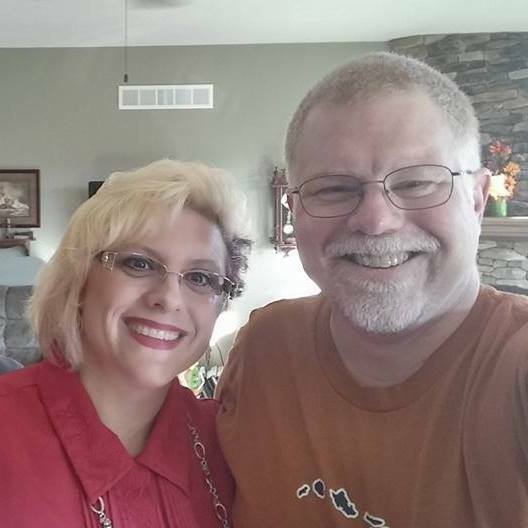 She has more fabulous creations - click below on her blog and check them out! 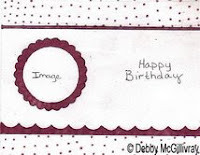 Here is Debby's Sketch challenge for the week. I have been a slacker the past 2 weeks and haven't done them! 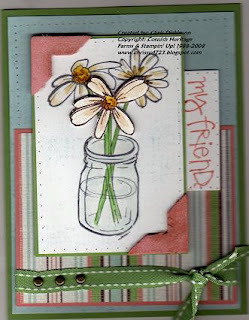 This week's Technique challenge on Splitcoaststampers was to MIX UP your Designer Papers. So that is what I did, but I went two steps further and did the Cracked Glass Technique and Beate's Weekend Sketch Challenge. 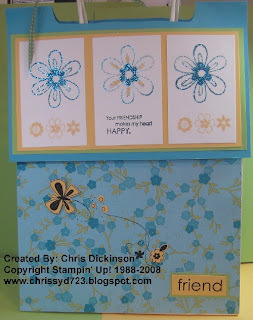 I had orignally started with this card and the floral stamp for the sympathy, but this BG was just too busy for the card. So I simplified it with the monogram for JESUS. 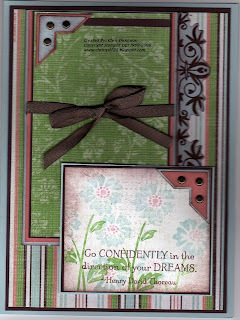 Once again, I used the Pounce technique from the Technique Junkies Newsletter- www.patstamps.com. 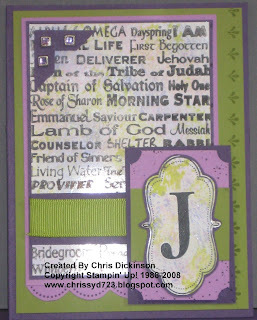 Stamp Sets: All Scallops, Frames with Flourishes, Itty Bitty BG, Names of Jesus - unknown - J monogram is a Rub On from Making Memories. Accessories: Paper Snips, 5/8 inch Old olive grosgrain, Dimensionals, Ice square brads, corner punch, ticket punch, 1/8 punch, cellophane. This is Beate's Weekend Sketch Challenge - check it out HERE. I made this for a friend - her mother passed away this week. I used the Technique Junkies Newsletter and tried the Pounce Technique - which was quick, not very messy and FUN! Thank you for looking! Have a great evening! I had a workshop last night and made the one with the Anchored Rub Ons for my friend Betsy. Well, I am demonstrating at a workshop tonight and I always like to take a gift. Tonight, I made a post-it note holder that will be part of the gift. I will share the picture of that and the directions soon. But this is the gift bag I decorated. These are the supplies I used- I even used a left over piece of the cardstock that was remaining from the Spray, Squirt and SMoosh technique. You can see that in a prior post I have here. If visual images make you queasy - do not look! this is not the worst injury I have seen, but still isn't pretty! This week, I have not had a lot of time to stamp. Monday night was Stamp Camp and Tuesday night, my Grace, tripped and fell and hit her head on our radiator splitting her forehead open. Then Tuesday evening, my little sweetie fell and hit her head on our radiator. That radiator is the culprit of MANY emergency room visits. Last year, my son Noah was playing Rock 'Em, Sock 'Em Robots and decided to free fall backwards on his head on the radiator. That required stitches too. So last night, the night I was going to stamp, Grace tripped and fell head first into our radiator and split her forehead open. She was SO brave and hardly even cried! We took her in and she got 4 stitches. Grace's 3 yo sister was SO concerned for her. So it was a late night for the kids. They are tired today! 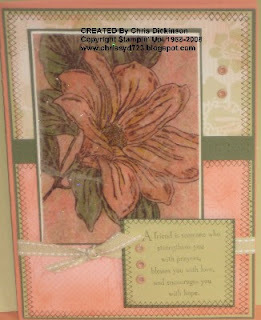 CBC5- Chrissy's Belli Challenge - CHIPBOARD! 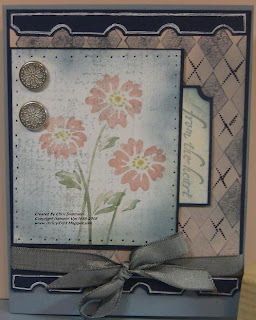 This Weeks Belli Challenge is CHIPBOARD! I painted this with Rose Red Craft ink then embossed Hologram Highlights over it and stamped the image on Shimmery White Cs and cut it out and used red sticky tape to attach it! 2. Ink it up with Craft ink. 3. I have even used Sharpie markers or a Pigment based marker like fabrico works great too, to get in the tiny grooves. 4. Use your cropodile and add some BLING to it. 5. Use it as a wall decoration or in a picture frame. 7. Use your Rub Ons. Be sure to post a link to your card mentioning my Blog and the Challenge for a chance to win a pack of FIVE handmade cards from me. 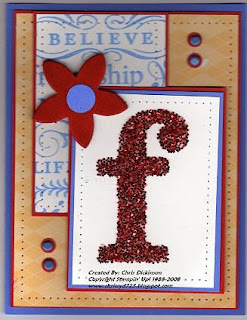 When you post to Splitcoaststampers or to your Blog, be sure and put CBC5 as the KEYWORD and mention of the challenge! Then make a comment under this with a link to your card and a number so we can do a Random drawing for the winner. Deadline to make a comment with the upload and do the Challenge will be on Monday evening. A random drawing will be held on Wednesday and the winner will be announced on Wednesdays! The winner will recieve an assortment of 12 x 12 cardstock! 20 sheets in total! 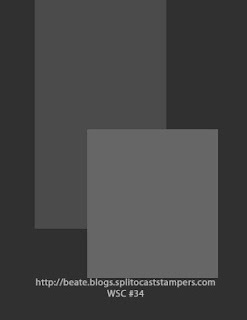 Here is the link to the Color challenge on Splitcoast - the color challenge was Ballet blue, Apricot Appeal and Real Red. Accessories: Sticky letters, Chunky Glitter, chipboard, half inch circle punch, Rich Regals Brads, Paper piercing Tool, Dimensionals. Thanks for looking! Enjoy your weekend! Cardstock and Ink: Bordering Blue, Night Of Navy, Whisper White, Blush Blossom & markers too! Accessories: Basic Gray taffeta, Styled Silver Hodgepodge, Dimensionals, sponge, White Gel Pen, Designer Label punch, Ticket corner punch. Thanks for looking! Have a great night! 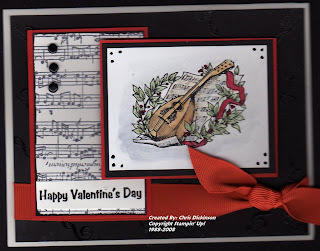 Well, this is WAY late- but I made a Valentine's Day card with Mary Jo's Lunchtime sketch Challenge. 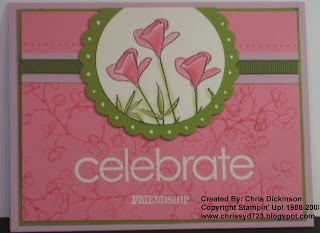 These are cards using the Stamp Set and paper from the NEW Occasions Mini that will be out in March! 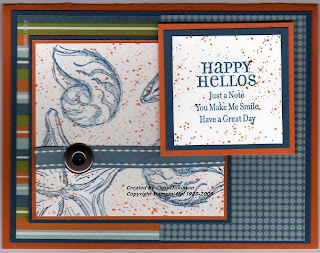 You will need to post my e-mail address along with the details of the Belli Challenge and card on your Blog and Splitcoast Stampers. Let me know if you are interested! You can e-mail me at adickinson@wi.rr.com. This Weeks Belli Challenge is WHEELS! Last weeks winner was Debby M! Congratulations Debby! 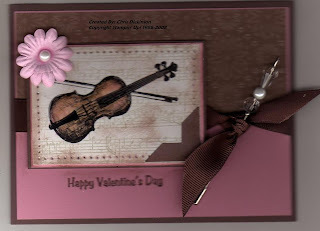 I will be sending you 5 hand made cards. Next weeks winner will recieve 5 Christmas cards. I am going to make another design for this week's Belli Challenge. It isn't necessarily an embellishment but a TOOL. This tool, I forget about ALL the time and tend to over look. This week's Belli Challenge is to pull out your WHEELS. Are you like me and leave them lie around only to grab your latest and greatest stamp set? Well, let's get ROLLIN' and get busy making cards, scrapbook pages, or ANYTHING as long as you use a wheel. 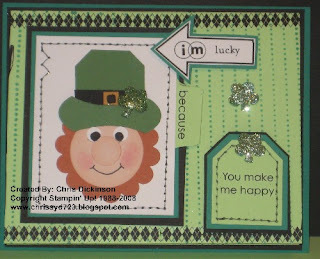 One extra challenge, which is going to be on my next card that I post is to use it as your main focal image! 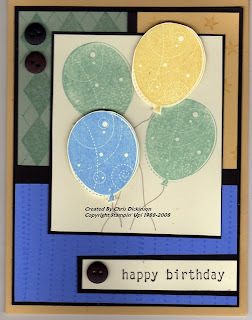 Here is a card I made using the Whimsy Jumbo Wheel as a background. I made 12 of these, one for each of my Stamp Club members. I appreciate them so much and want them to know! Now that I look at this, I meant to put some glitter on that little flower with in the heart! Be sure to post a link to your card mentioning my Blog and the Challenge for a chance to win a pack of FIVE handmade cards from me. 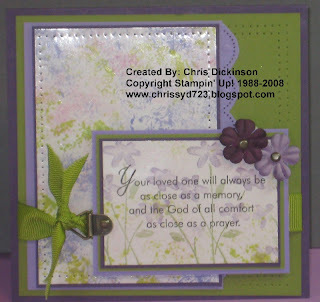 When you post to Splitcoaststampers or to your Blog, be sure and put CBC4 as the KEYWORD and mention of the challenge! Then make a comment under this with a link to your card and a number so we can do a Random drawing for the winner. Deadline to make a comment and do the Challenge will be on Monday evening. A random drawing will be held on Wednesday and the winner will be announced on Wednesdays! I will post more in awhile. Have a fabulous day! Well here is my son's birthday card using the Spray, Ink and Smash technique challenge. Check out the details here. I couldn't edit the photo as far as cropping it, due to my personal computer has died and on my dd's computer which doesn't have the same software. Thanks for looking. Have a fabulous day! I started this image earlier when doing the other card for Beate's sketch challenge. I was STUMPED with this because I was TRYING to use Soft Sky and it wouldn't WORK. But then my friend Holly gave me the colors to use and then it all came together. Technique - Emboss Resist: I colored the image with the markers (and missed some of it if you look closely enough!) then stamped it in Versamark and embossed with clear EP. Then I sponged the Soft Sky, Wild Wasabi, and Chocolate chip around the embossed image. Then wiped the excess ink off with a kleenex. Ahh- this card took some time! Only because I kept putting things together and it didn't look QUITE right! The flowers stamped on this are actually more visible in real life. All of these stamps are from my pre-order of the Occassions mini. I just got my order this evening and I absolutely LOVE this For father stamp set! Perfect for masculine cards! 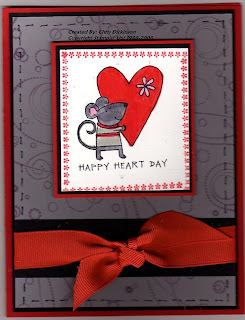 This is another card I made for my friend Joann. She has a very musically talented family! Adela Rossa's card served as my inspiration, here is her card - I copied most of it, just changed a few things like the stamp set, added some paper, etc. Thanks you for looking! Have a blessed day! Chrissy's Wednesday Belli Challenge #3 - BUTTONS! Every week that goes by, I think WOW - that went fast! You will not believe it but with only two participants this week - JOAN ERVIN won the drawing again! Congratulations Joan. Joan wins the Build a Flower accents and Elements. Since we only had 2 participants this week, I am mailing Trish the consolation prize of the crabby Valentine card. Thank you for playing! This week we will pull out our BUTTONS. I have several storage containers filled with a wide assortment of buttons, many of those items that were HAD TO HAVE and then I rarely use them. LOL So pull out your buttons and create! Be sure to post a link to your card mentioning my Blog and the Challenge for a chance to win a pack of FIVE handmade cards from me. When you post to Splitcoaststampers, be sure and put CBC3 as the KEYWORD and mention of the challenge! Then make a comment under this with a link to your card and a number so we can do a Random drawing for the winner. 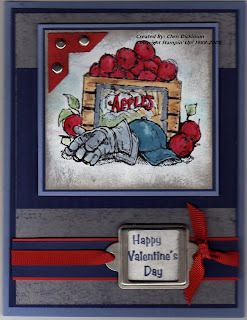 Well the Sketch challenge for Splitcoast came up early and I had just so happened to be there stamping a Valentine's Day card for my friend Joann. Here is the LINK for the sketch challenge. I even got to use my NEW Copic Markers. I only bought a few basic colors and I love how they blend so beautifully! I bought a color pallette too to mix colors on - LOVE THEM! Accessories: Copics, 5/8 red grosgrain ribbon, Clear EP and Heat Tool. Black Vintage Brads, Dimensionals. Thanks for looking! Don't forget to come back for the Belli Challenge tomorrow. It will be posted before lunch time! Have a blessed evening! 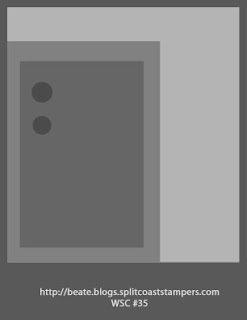 This is a card we made for my Card Craze. It was fast and simple but I liked the color combo. It is not one I use very often either! My friend Trish made a card using this sketch and it inspired me to make this one. Thanks Trish! Ink: Same Accessories: Jumbo brads, Cropodile, , Dimensionals, Double Stitched Blue Bayou Ribbon. Thanks for looking! Have a fabulous day!